Over the years, one of the greatest satisfactions this writer has had is tutoring priests of every age group in the celebration of the traditional rites. Like anything worthwhile, the work can be joyous, tedious, frustrating and rewarding all at the same time. Since I began doing this in 1986, many priests have requested such tutorials, either under the aegis of the St. Gregory Society of New Haven, since I am one of the Masters of Ceremonies at St. Mary's Church in Norwalk, Connecticut, or since my appointment as MC of the Church Music Association of American’s annual Colloquium, this year in St. Louis. All three have served as avenues for clergy and seminarians to request help in learning the rite. Armed with books, cards, cheat sheets and the like, the men use other aids as well. Whether it’s the St. John Cantius material at Sanctamissa.org, or the FSSP tutorials, they like the personal coaching to go along with the materials offered by those and other fine organizations. Recently, St. Mary’s music director David Hughes and I had the honor of assisting at a priest’s first Traditional Mass. It was a very spiritually powerful event. David provided the music, while I served as master of ceremonies for a Missa Cantata. What made it special was that it was a votive mass where only nine people were in attendance, not including visitors to the church. Where and when is not important, nor is the name of the individual. What this post aims to relate is not an individual event, but the proliferation of several of those events. The story is always the same. A priest or seminarian makes contact through one of the above-mentioned organizations. They want to learn the traditional mass and traditional forms of the Sacraments, they have the materials from one group or another, but need that personal training. In each and every situation, we have a person steeped in Catholicism and longing to be the best servant he can be. 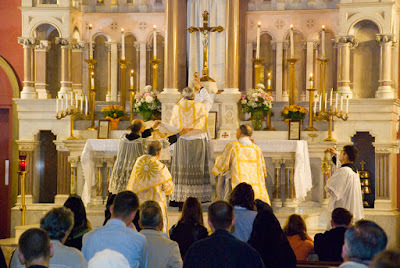 Some studied the Mass while in seminary -- the fruit of the sea change caused by Summorum Pontificum -- but were unable to celebrate due to the pressures of parish life. Some have been encouraged to learn it by people in the diocese, but must find their own mechanisms to do so, as the diocese offers nothing. Still others have been asked to say the Mass by a group of people, and see this as a starting point for learning something they’ve wanted for a long time. Most have not even a nodding acquaintance with the days preceding the Second Vatican Council. They do not know about, nor care about, the politics of years ago. They all understand there are prelates who disapprove of the Traditional Mass, but there are many bishops who encourage their men to learn it. What they don’t want is the polemic of an era gone by. Their interest is learning the “Mass of the Ages,” to understand the Mass they were ordained to celebrate daily. Each takes something away from the tutorials, and certainly from the celebration of Mass. Fr. Richard Cipolla, pastor of St. Mary’s, is a longtime friend, and one of the priests this writer has had the pleasure to watch since the Indult days. He tells the story of his first Mass in New Haven, which he related in a post on NLM in 2013. For him, the Unde et Memores prayer right after the Consecration was a life-changing moment. In this most recent first Mass, the priest found that the Suscipe Sancte Trinitas prayerjust before the Orate Fratres was his favorite. Each has a special prayer or moment when things seem to click. For trads sometimes, it is not a question of “glass half-full” or “glass half-empty.” Many don’t think they have a glass, but they do, and it is filling up. When Pope Benedict XVI instituted Summorum Pontificum, he hoped there would be an influence of the older rite on the new, and vice versa. It is happening. It may not be as quickly as we like, but it is occurring. Even those priests and seminarians not interested in the traditional rites are being influenced by tradition in the new emphasis on the Ars Celebrandi. The crop of seminarian and priests coming through the ranks for the most part have an interest in tradition, and a love for all that is the Church. Truth and beauty are objective realities to them, and they see the deficiencies that have arisen because of a pervasive minimalism. As someone who has been in the liturgical trenches for most of his adult life, this old war horse can tell you things are looking up. If this sounds like a pep talk, it is. It is not a Pollyanna outlook. There are real problems in the Church. They will have to be addressed. The liturgy, and particularly the ancient Mass of the Roman Rite, will be one of the means used to solve those problems. I’ve seen the proof first-hand.